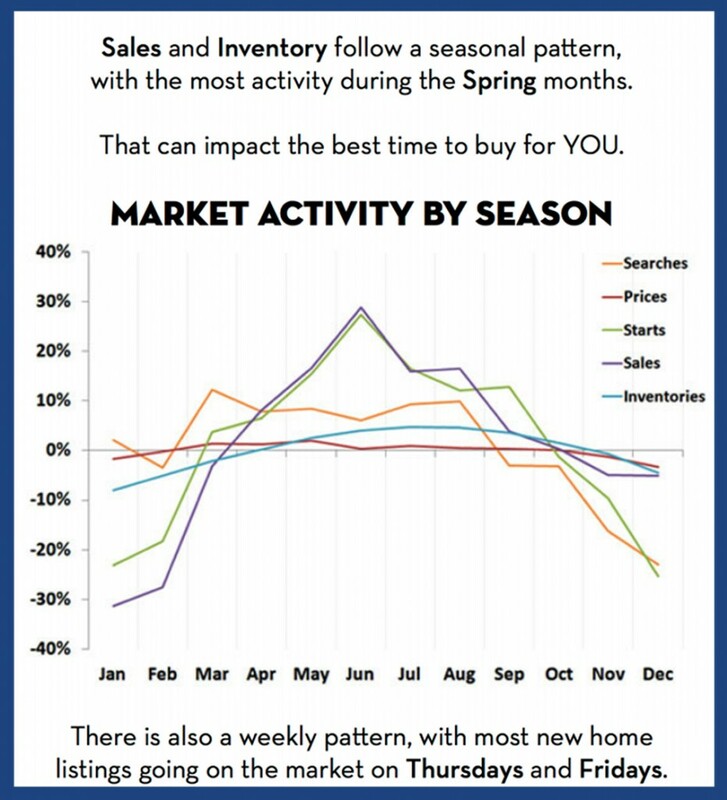 Buying or selling in the DC metro market means becoming attune to the seasonal shifts in market activity. Whether you’re listing a home or searching for one, you need to change tactics depending on the time of year. Spring is the busiest and most active time of year. It’s considered a market windfall for most of you, right?! However, the ebb and flow of the market is not quite so simple to describe. There are twists and turns to the level of seasonal activity in our market that you need to be aware of as a buyer or seller. What’s most important is to take advantage of an increase in market activity or decrease in activity … yes, even a decrease! Most importantly, make sure you know how to prepare and respond to the cyclical flow of the market so you can become a happy buyer or seller. If you’re a serious buyer or someone who is thinking about buying, you’ll get a better idea of why timing can affect how you go about looking for a home. And, sellers will gain some insight on why your strategies to attract buyers may change depending on the month. Weekly cycle – homes tend to come on the market on Thursday or Friday. Buyers need to have their research (needs, wants, deal breakers, location, lifestyle) and finances (budget, mortgage pre-approval, absolute max offer price) in order by Tuesday if you want to be able to make a serious offer when homes hit the market by Thursday. Certain times of the year like the springtime and early fall you could face lots of competition from other buyers, so be ready to make quick decisions with no regrets. Sellers may want to get a jump on the market by making their home available for viewing on a Wednesday to tap into the more serious buyers who want to make an offer on a home. Weekends can bring out the more curious rather than determined homebuyer, especially during the busy spring season. We’ve all been an “open house” junkie at times! Remember that agent showings can be an important strategy to get the word out to other agents and their clients during slower times in the market. Suburban homes follow the school calendar and tend to become available in April/May. Buyers who have targeted more suburban or family-friendly neighborhoods should prepare for heavy competition from other buyers and hectic weekends of looking in the late spring. If you want to be settled in your home by summer and prepare your children for the new neighborhood and school, it’s important to be an educated buyer ASAP. That means know your budget, know your needs and wants (and deal breakers), and get ready to play hardball if necessary! On the flip side, if you’re a serious buyer be on the lookout for homes that come on the market at other more quiet times of the year. This is perfect for many first-time buyers who aren’t wedded to the school calendar. Be patient, be flexible, and stay in touch with your agent so you don’t miss any opportunities that may come along. Sellers who have homes in these neighborhoods need to get their homes ready for listing by early spring. That means getting your home in “show-ready” shape by purging stuff, cleaning top to bottom, refreshing with painting, staging rooms, and creating springtime curb appeal. Start working with an agent and planning for this move as early as possible – late fall before the holiday rush or early January – so you can properly time your listing for this rush of serious buyers. You still need to price your home right, but the competition amongst buyers can increase it! The market slows down in July and August but picks up right after Labor Day. Buyers who are serious and more flexible should still keep an eye on the market even though fewer homes are listed over the summer. So don’t go completely on “vacation” from looking! Keep in mind that sellers are usually more willing to negotiate on price and terms if they need to make a sale during this market lull. Sellers need to tap into those serious buyers who haven’t completely stopped looking. If you live in a young, hip neighborhood, you’ll be better off attracting first-time buyers or couples who have more flexibility when it comes to moving. Price your home right, be generous with your terms, and make your home a summer oasis for them. For those in suburbs or in neighborhoods tied to the school calendar, it’s critical to price your home correctly to bring in foot traffic or serious buyers. And even better, wow them with a home that is more move-in ready than not. Again, be generous with your terms and conditions and showcase your home so it looks like a great place for a summer staycation! A yearly chart spotlights the highs and lows of market activity in several key categories. Searches – Buyers are searching the most in March. Can be more investigative or educational for would-be buyers who are preparing themselves for the spring. If you do need to list at this time, you could snag one of these many potential buyers if you market your home correctly. Prices – Prices appear to hold somewhat steady throughout the year with the lowest being in December and January. Sellers need to keep this mind that pricing their home correctly is important no matter what time of the year they list. Housing Starts – Construction of new inventory peaks in June, typically rising and falling along with the weather. Lots of construction in the springtime near condos and in certain neighborhoods can play a part in how sellers price and market “older” homes. Buyers need to be aware of the changing landscape of even urban neighborhoods now. Sales – As expected, the number of sales takes a steep climb up after February and then peaks in June. It’s a slower route going down through the remaining year. January has the least number of sales — cold or snowy weather can influence the lack of buyers trekking out to see homes. Inventories – Inventory does increase in the spring but not as drastically as one might think. The number of homes on the market is a steady curve rising until June and then going down until December. More buyers with almost the same amount of inventory mean lots of competition for those homes. But it also means your home will get traffic if you list it … how you market it depends on if it’s sold well. 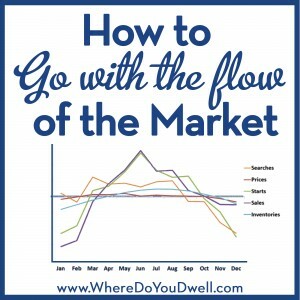 Do you want to know how to take advantage of these ebbs and flows in our housing market? Whether you are a buyer or a seller, we can help and show you what to expect and how to react based on when you plan to enter the market. Call us today and we can get started!